Today, I’m playing with Some Odd Girl stamps. These make the perfect images for adorable everyday cards. I paired these images with a some Basic Grey & Bo Bunny papers for the cute finished cards. The first was a card for my friend Holly. We tease her and call her Elmyra, because when it comes to animals, she wants to hug them and kiss them and love them forever. I thought of her immediately when I saw Snuggly Tiny Tia. She was perfect. And with her Holly-blonde locks and little grey kitten, it’s the perfect card for her. This turned out to be my favorite card. Tweet Kaylee was so cute on the lemon yellow papers and it made a sweet card for my friend, who was having some unfortunate relationship troubles. She needed a little something to brighten her day. 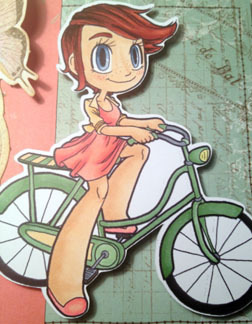 My third card was made using the Bicycle Kaylee stamp. I decided to make her a redhead for this one. I want that bike!